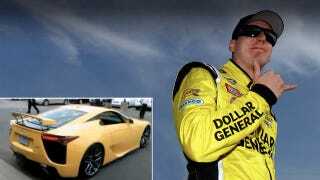 Nascar points leader Kyle Busch lost his driver's license for 45 days yesterday for driving 128 mph on a road close to a day-care center and church in a nearly $400,000 Lexus LFA. The car was bright yellow. It was real nice. No, he didn't get it at Wal-Mart. Luckily for Busch, he doesn't need a license to compete in NASCAR. The top left-turning racer was also fined $1,000, sentenced to 30 hours of community service and put on one year of unsupervised probation. Busch pleaded guilty to speeding and no contest to reckless and careless driving in North Carolina District Court in Iredell County.